Diese moderne Villa mit mit umfangreichen Fenster und Glastüren wird um Pool und üppigen, tropischen Garten. Ein großes Zimmer mit hohen Decken umfasst Wohnzimmer, Esszimmer, Küche und Eingangsbereich, wo Familie und Freunde können bequem zu sammeln. Eine große überdachte Terrasse bietet weitere Essen und Liegeflächen. Diese Immobilie ist komplett privat und sehr romantisch. Jedes Zimmer verfügt über eine eigene Terrasse. Es gibt eine Master-Suite mit Kingsize-Bett und Marmorbad in der ersten Etage. Ein zweites Schlafzimmer im ersten Stock verfügt über zwei Einzelbetten (die zu einem King-Size-Bett umgewandelt werden können) und ein eigenes Bad zusammen mit einem dritten Schlafzimmer mit einem Doppelbett im Erdgeschoss. Darüber hinaus gibt es eine romantische zweite Master-Suite mit Doppelbett und eigenem Bad auf der zweiten Etage. Die Terrasse im dritten Stock bietet eine beeindruckende Aussicht auf Berge und Meer. Unsere Villa ist nur drei Blocks von berühmten weißen Sandstränden entfernt, für die Bucerias berühmt ist. Zweimal wöchentliche Reinigung, Gärtner und Poolpflege wöchentlich. WIFI in der Heimat. The house was everything we anticipated. It was clean and comfortable for our group of seven adults. The location is perfect for enjoying the town of Bucerias, spending the afternoon on the beach or enjoying the shady patio and pool area. The pool is not heated and is in the shade almost 100% of the time, so it was "refreshing" to say the least. Thank you for the great accommodations for our vacation. We've been staying at Suenos since 2004, we obviously really love it! The house mixes modern amenities with beautiful classic architecture. The patio and pool are one of our favorite places on Earth. The villa has complete privacy, very peaceful and quiet too. Suenos is an opulent get away for a couple (we just did this) and is great for a family or group of friends. Cant say enough about Suenos we truly love the place and look forward to going every year! 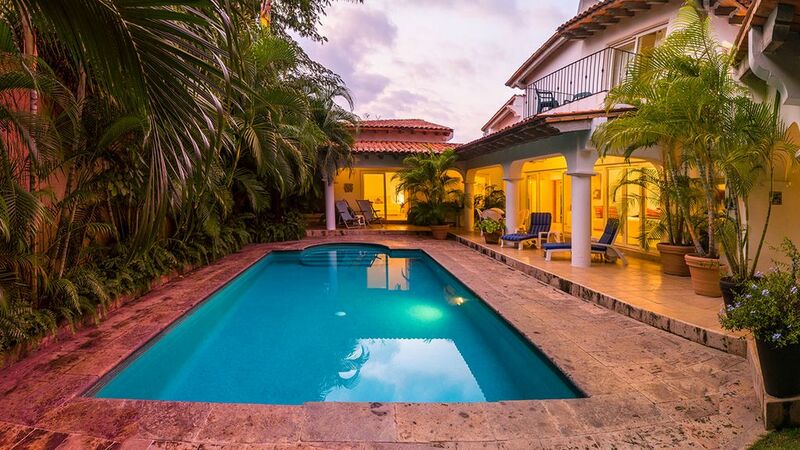 Casa de Los Sueños is a luxurious getaway home for a large family or just a couple. We stayed for our 5 year Anniversary with another couple. We enjoyed every aspect of this amazing home. From the super comfortable beds, the big showers, the amazing pool, and the kitchen that has all the items you need to make a wonderful dinner or breakfast. We rented a car from Gecko that came highly recommend from the owner Justin. They provided us with a shuttle to and from the airport, and helped us booked two excursions while we were in Bucerias. I am so glad we took his advice we were able to go on some day trips to a couple of amazing beaches and not have to walk everywhere. Justin was super helpful to work with he provided us with a list of the best beaches to visit, helpful tips, and the best restaurants. Adam the house manager was extremely helpful once we arrived in Bucerias, he answered any and all questions we had during our stay. We truly loved our visit and highly suggestion booking this home when visiting Bucerias. Thank you so much Justin and Adam!! We can not wait to make our way back!! We have stayed here many times. I highly recommend it. In person, it is a beautiful as the pictures. Just 4 blocks from the ocean and many excellent restaurants all walking distance. We shopped at Beto's store just 1/2 block away - he stocks an amazing variety of things. The bank is across from Beto's - very handy for exchanging dollars. Adam is the house manager. He is very friendly and responsive - and speaks excellent English. This is truly a home away from home. Loved our stay. Lots of space. Well stocked kitchen. Peaceful garden/pool area. Close walk to beach, shops and restaurants. Great place to relax and enjoy the beauty of Bucerias. My family stayed here for a little over a week during Christmas Holiday. It was excellent. Everyone had a great time. Being so close to the beach and town made this the perfect location for us. Then, when we were ready to just kick back and relax, the house and yard gave us all the feeling of being at a resort, but we had it all to ourselves. All of the staff was very friendly. Adam was very accommodating in helping us with anything we needed. Thank you for making our holiday so lovely. Weltklasse-Restaurants, Walbeobachtung, Vogelbeobachtung, Paddle-Boarding, Surfen, Kajak fahren, Golf, Yoga, Hochseefischen, Tennis, Wassersport und vieles mehr!